About stamps, covers, news from the philatelic world. 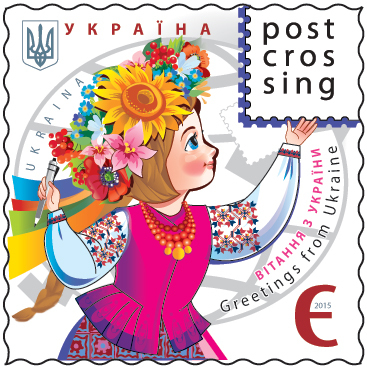 Updated 23 June 2018 with the stamp of Moldova. Since a post on May 17th, 2014, I have updated a personal stamp catalogue celebrating Postcrossing, a website to send and receive postcards among members either by chance through the site, or voluntarily through the forum if you want to exchange mail with specific countries or on specialised topics. Don't hesitate to participate, even with a few cards per months: it's the way to ensure there will be a conteporary stamp and postal history in the decades to come. In ten years, celebrated on last July 14th, more than thirty one millions cards were sent. 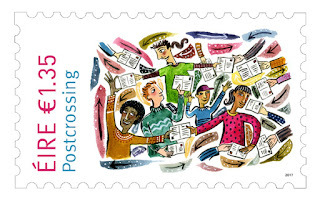 The main source is the website's blog and, from there, the website of the postal operators who issued the stamps. As you are going to see hereunder, many post offices understood the interest to issue such stamps: encouraging correspondance, national and foreign philatelic orders, free publicity. 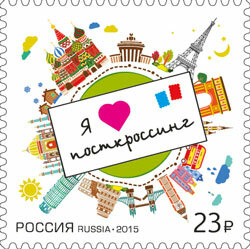 Shamefully, the French philatelic service, Phil@poste, did not... yet? Even a strict dictatorship encouraged its citizens to write and receive mail! Since 2011 till today, twelve stamps were issued for this website by the will and lobbying of its members. What voluntary website can say that too? 1. and 2.: 14 October 2011, by Post NL, Netherlands, 2 values (first class to Europe, first class to the World) issued on a minisheet of five of each (10 stamps). 3. to 6.: 9 September 2013, by Itella Posti, Finland, 4 designs at the same first class value (up to 50 grams nationwide, 20 grams to Europe and the World) printed on a minisheet. 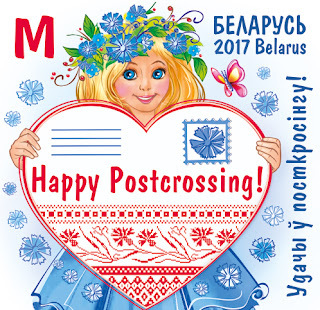 7.: 2 January 2014, by Belpochta, Belarus, value "N" (surface postcard) in sheets of 12. 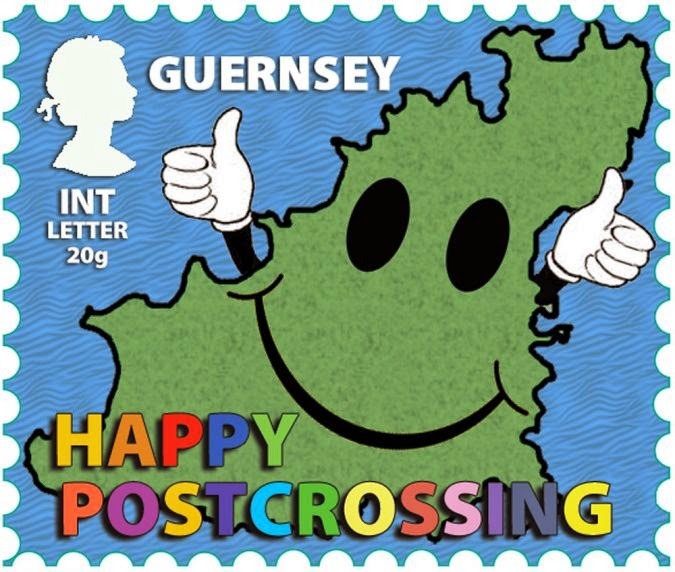 8.: 29 May 2014, Guernsey Post, one of the Channel Island and Crown Dependencies, value "Int Letter 20g" (first class to Europe and the World) : map-character of Guernsey wishing the reader a "Happy Postcrossing". 9.: 27 January 2015, by Pochta Rosii, Russia, 23 roubles. Designed by O. Shushlebina, an envelope on globe decorated with all major European historic monuments and the Taj Mahal. Printing: 397 000. 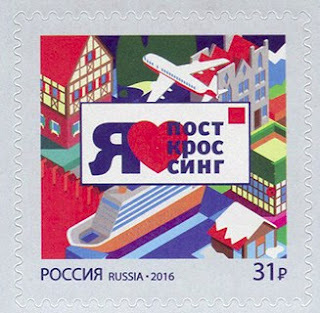 Members from Russia constitutes the second group by country on Postcrossing with 3.5 millions postcards sent, after members from Germany. 10.: 29 May 2015, by Pošta Slovenije, Slovenia, 60 eurocents. A tourist jumping on a blond sand beach. "Summer is coming". 11.: 2 September 2015, Česká pošta, Czech Republic, Value "E" (up to 50 grams to Europe ; "A" is nationwide, "Z" worldwide). 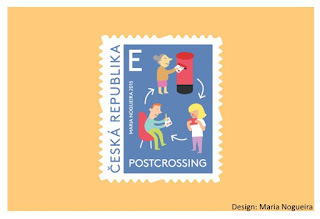 The Postcrossing circle of correpondence designed by Portuguese artist Maria Nogueira. Let's remind the website was created by Paulo Magalhães, another Portuguese citizen. 12.: 9 October 2015, by Ukrposhta, Ukraine, value "E" (I'm not fluent enough in Ukrainian to find the rate...) in sheet of 16 autoadhesive stamps. Girl dressed traditionally sending her greeting from Ukraine to the world. The stamp was issued on World Post Day, an initiative by the Universal Postal Union. 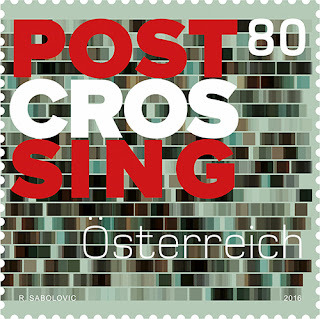 The Austrian Postcrossing stamp... A wall of bricks? (Österreichische Post via the Postcrossing blog). 13. 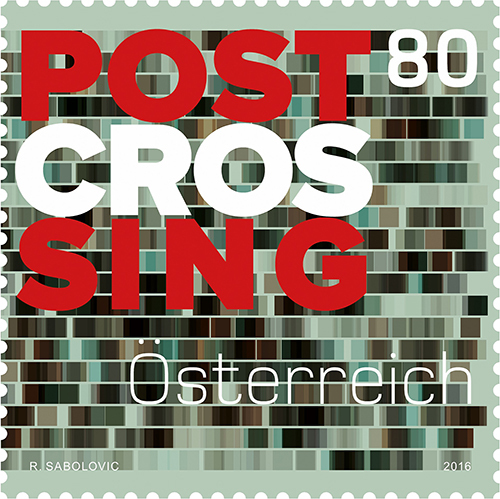 (AUT #1): 21 March 2016 by Österreichische Post, Austria, value 80 eurocents. 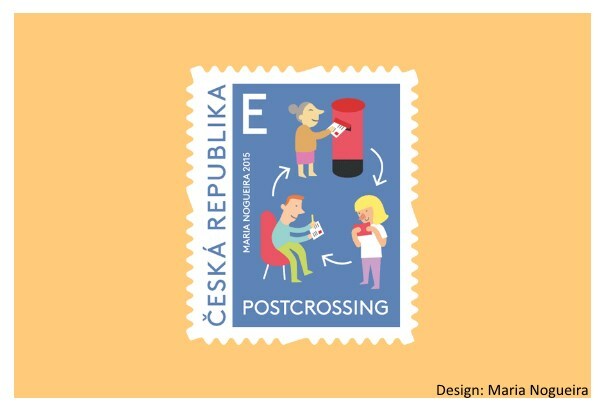 Designed by Robert Sabolovic (postcards and name of website in the color of the Austrian flag). Printed in offset by Joh. Enschedé Stamps B.V., 250,000 printed. The second stamp of Russia (rusmarka.ru). 14. (RUS #2): 25 March 2016, by Pochta Rossii, Russia, value 31 rubles, sheet of 9 autoadhesive stamps by I. Sidenko. Envelope "I love Postcrossing" over landscape of different houses, with airplane and cruise ship. Print: 414 000. 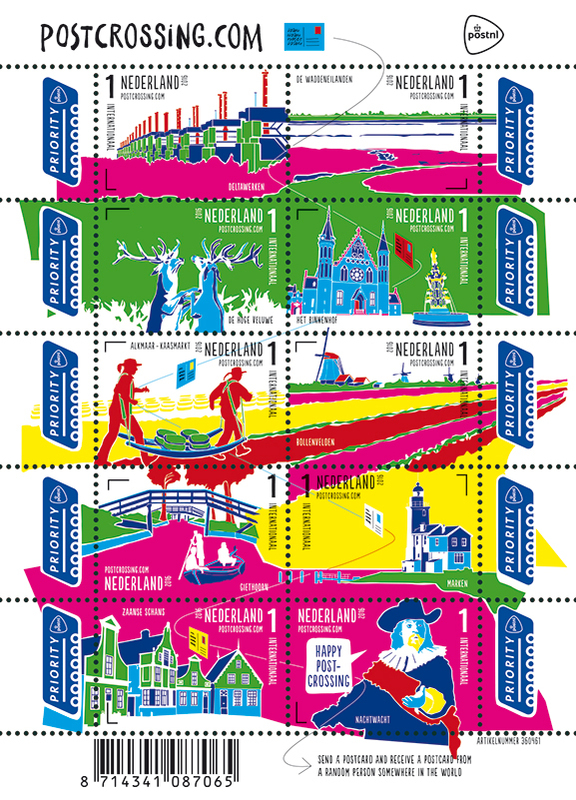 Second issue for the Netherlands, 2016. 15.-24. (NLD #2): 29 March 2016, by PostNL, Netherlands, value "1 International". 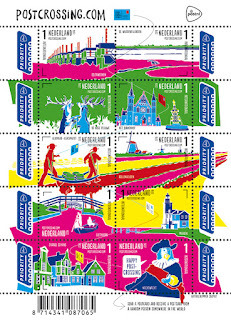 Sheet of ten different stamps designed by Reinier Hamel, Sin agency. Different landscape, monuments, activities and artwork of the Netherlands. Second Guernsey issue, 2016 (guernseystamps.com). 25.-26. (GGY #2-3): 14 July 2016, by Guernsey Post, value Europe (EUR) and Rest of the world (ROW). Illustration by Sue Harmon, printed in sheets of 10 and in offset by Lowe-Martin. Depiction of the Bailliwick's islands (green), their fauna and flora, the sea waves and the sun. Le timbre de cinq nouveaux złotys (site de Poczta Polska). 27. (POL #1): 14 July 2016, by Poczta Polska (Poland), value 5 new złotys (PLN), printed by PWPW in minisheet of 6 with illustrated margins. 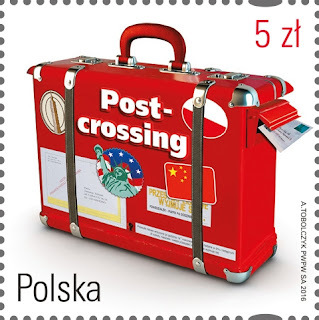 Design by A. Tobolczyk: a red suitcase with touristic stickers, is in fact a mailbox to send postcards. The second Belarus adhesive stamp issued January 2017, with no fake perforation (Postcrossing blog and Belpochta). 28. (BLR #2): 3 January 2017, by Belpochta (Belarus). Adhesive stamp value M (international airmail postcard), printed in offset in 9 stamp minisheet. Illustration by Marina Vitkovskaya. The stamp from Romania issued February 2017 (Postcrossing blog and Romfilatelia). 29. (ROM #1): 24 February 2017, by Poșta Română (Romania). Stamp value 4 lei, printed in offset in sheets of 32 (18'000 sheets) and minisheet of 8 (1'000 sheetes). Illustration by Razvan Popescu. The three Indonesian stamps issued July 2017 (Postcrossing blog). 30.-32. (IDN #1-3): 14 July 2017, by Pos Indonesia. Three stamps, value 3,000 rupees, illustrating travels through correspondence. 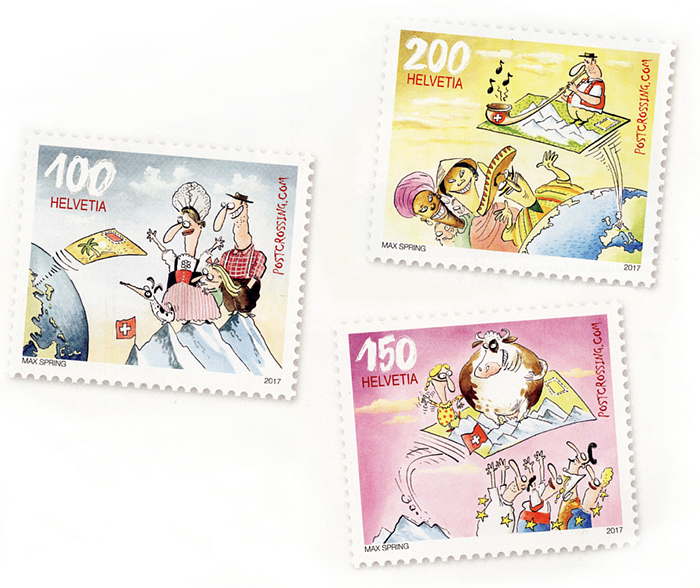 The three stamps of Switzerland Postcrossing blog, 28 July 2017). 33.-35. (CHE #1-3): 7 September 2017, by Swiss Post. Three stamps, values 1 franc (national rate), 1,50 franc (European rate) and 2 francs (worldwide). 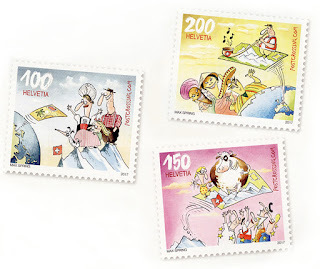 Designs by Max Spring illustrating Swiss people receiving a postcard and people of the continent and the world receiving traditions of Switzerland on postcards. The Irish stamp (via the Postcrossing blog, 4 October 2017). 36. (IRL #1): 5 October 2017, by An Post. 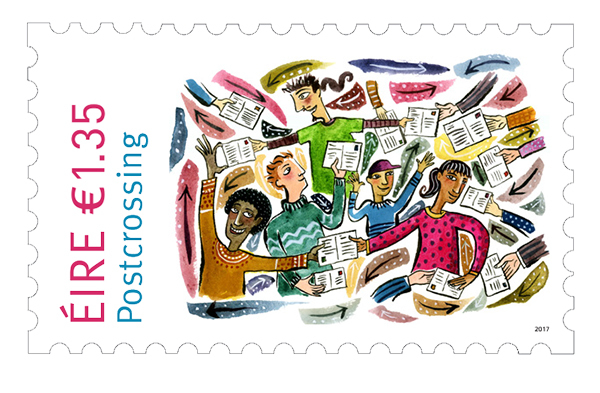 One stamp valued 1.35 euro (international rate) figuring five young peoples and other people's arms sending and receiving many postcards ; a design by Cathy Dineen. Note: Irish postcrossers appeared in a documentary on the General Post Office in Dublin, broadcast by RTÉ in March 2016. The stamp from Hungary (Magyar Posta website). 37. (HUN #1): 2 February 2018, by Magyar Posta. 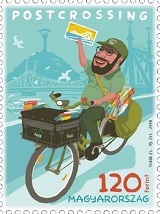 One stamp valued 120 forints (2 domestic rates: non-priority postcard or standard letter under 30 grams) figuring a postman on bicycle happily delivering postcards. With landmarks of Budapest in the background: the Danube river, the Liberty Bridge and Liberty Statue. Design by Zsolt Vidàk and printed in offsetin 60,000 minisheets of four stamps. 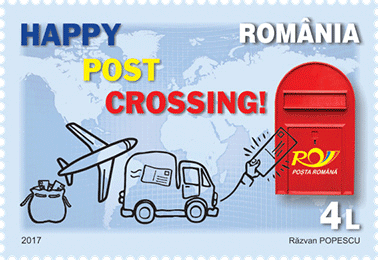 The stamp from Moldova (Postcrossing blog and the Moldovan Post's philatelic website). 38. (MDA #1): 23 June 2018, by Poșta Moldovei. 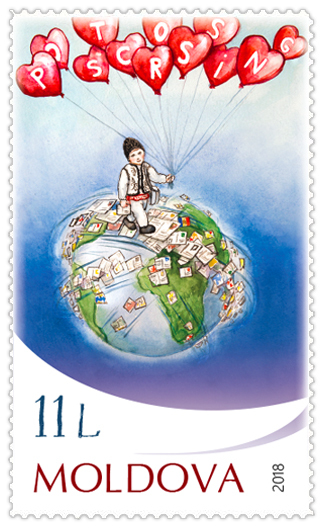 One stamp valued 11 lei (international prioritary postcard to Europe ; almost worldwide non prioritary rate - 11,50 L) figuring a person travelling upon the globe on paths made of circulating postcards and letters. Design by Lilian Iatsko and printed in 120,000 in sheets of ten. To be continued of course (and completed when I find the pictures missing). Happy Postcrossing to you too! Texts and pictures by me, but if copyright between brackets (fair use).. Simple theme. Powered by Blogger.